An interesting facet of any older firearm is determining its history. For most Stars, there is no way to track down their history, but one of the best general indicators may be if it has a crest indicating issue to some army, police or paramilitary group. I am very much not an expert in this field, so will rely on you to send me good images, and tell me who the the crest belongs to. Also, to keep up the standards, I will try to trace them all so they are clearly posted. More will be coming when I get around to it, this is just for starters. The Guardia Civil is a Spanish federal paramilitary police force of the type called a gendarmerie in many countries (for comparison, see the similar Italian Carabinieri and French Gendarmerie). It was founded in 1844 by Queen Isabel II of Spain largely as a border police, which remains one of its primary duties. The color image below is the full insignia of the Guardia. Some of all of it may be found on firearms as a rollmark, but most carry the simplified version with the elaborate GC letters, and the crown, as shown in the black and white variant. At least one source reports that some pistols issued to the Guardia will not have this crest, and will simply be marked with "CG" on the right side of the frame. 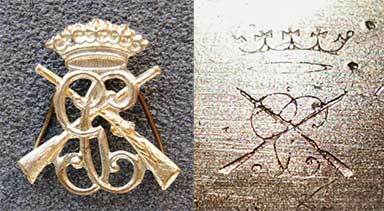 A specific variant of the GC crest is found on some pistols, with crossed rifles over the letters. This was only used by the Guardia Civil Carabineros, a specific unit with some political troubles I do not follow, from about 1940-43. It may additionally help date your pistol. We have also seen a few pistols with simple "GCC" marks which we assumed were Guardia, but may be part of the same unit designation, just later than 1943, but I have no proof of that. The Spanish Air Force issued the Model S for many years. Though replaced some time ago they appear to be issued to the individual, who may use it as long as they like, and possibly gets to keep it when leaving the service. I would not be surprised to find a few senior officers still have Model S pistols in their holsters. 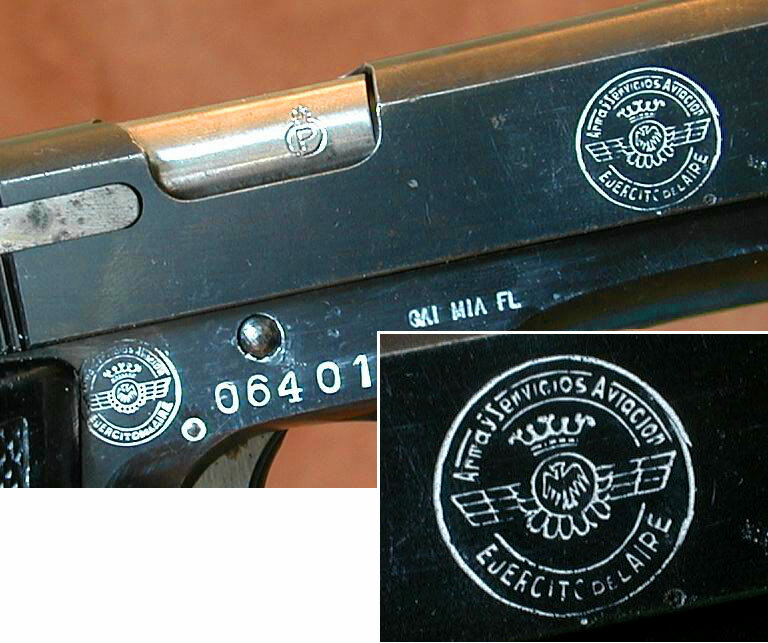 These pistols appear to always have a crest as shown with the Air Force winged emblem in a circle with the words "Arma y Servicos Aviacion - Ejercito Del Aire." This is placed just forward of the right stock panel, behind the serial number (sometimes slightly under the stock panel) and a larger one is on the right side of the slide, somewhat forward of this. The example is not atypical, with the crest picked out in white, but this was a modification by collectors or some Air Force officers proud of their branch; it is not original to the Star factory or the Air Force issuing agency. Most or all of these will be commercial guns, with the Model S designation, and no military acceptance proofs. I am not sure if this is simply because the Air Force is small, or independent or the military stamps specifically mean "Army" after all, but it is the case, and do not think a commercial gun with such stamps is a fake. 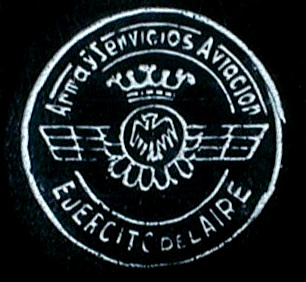 A small number of Model As with slightly different marks (ARMA TROPAS AVIACION - EJERCITO DEL AIRE) also exist. These are apparenty for a security police or some sort of Air Force soldiers, instead of the aircrew pistols the Model S served as. They are also commercial Model As, not M1940 military contract guns. "CSP" on the right side of the slide indicates issuance by the Spanish National Police or Cuerpo Nacional de Polic&1acute;a as they are now called. The German Landespoleizi is a group of law enforcement organizations, one per german state, broadly equivalent to the state police organizations in the US. They should not be confused with the German Federal Police. Star Pistols (and possibly others) issued to them in post-war East Germany carry the stamp "LPN" on the frontstrap (the usual abbreviation for the police is LaPo sot it may eventually emerge its something else or more specific, like the mark for just the Northrhine-Westphalia force, perhaps). The also usually meet other german military requirements, and have the last three digits of the serial on most parts. They will all carry the conventional commerial production proofmarks on the frame, as well as the "passing of proof" mark on the barrel, usually on the barrel hood.